Rakesh Jhunjhunwala, Vijay Kedia, and Porinju Veliyath are few successful investors of the stock market. What makes them successful investors? Where they invest their money? How successful investors make money from the stock market? These are some common questions which we keep on hearing almost every day. Most of the time we don’t have answers to these questions. In this post, I will try answer these questions. How to become a successful investors in the stock market? Although the sure-shot formula for the success in the stock market is yet not discovered, here are strategies followed by successful stock market investors. 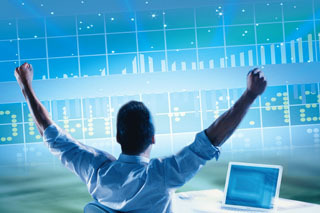 These strategies will surely help you to become successful in the stock market. Historically it is seen that over a longer duration stock price appreciation is much higher. You can get benefit of dividend year on year. You can take advantage of stock split or bonus over a longer duration. You should look at opportunity while investing in stock market. The second investment strategy followed by Rakesh Jhunjhunwala is look for future business opportunity while investing in stock. RJ made a lot of money in stocks like Parj Industries because he has seen a future business opportunity of ethanol in India. This is most common investment philosophy of every successful investor. Invest in only best managed companies. Vijay Kedia is a successful name in the stock market. Vijay Kedia investment strategy is to invest only in the best-managed companies. Good management in bad business is better than bad management in good business. If you invest your money in the best-managed company, you need not worry about market volatility. Vijay Kedia believes in booking profit periodically. As per him when a stock has reached a target or when a stock looks overvalued you should book a profit. A balancing act on your portfolio always helps. You should not hesitate to cash in the gains. Remember – A successful investor is always right when it comes to buying and selling stocks. They know when to buy, what to buy and when to sell. You should identify and invest in high-quality lesser-known stocks. In order to identify such stocks, you need to do careful research. The entire portfolio of Porinju is full of less known stocks such as Gokaldas Exports or Nirvikara Paper Mills. Dolly Khanna is known as a lady with Midas touch. She follows a strategy of investing in stock based on facts. She advises that you should never invest in stock based on speculation or insider information. You should invest in a company with strong balance sheet. In order to do that, you should learn to read annual reports and balance sheet of the companies. After looking at investment philosophy of successful investors let’s take a look at where they invest their money. 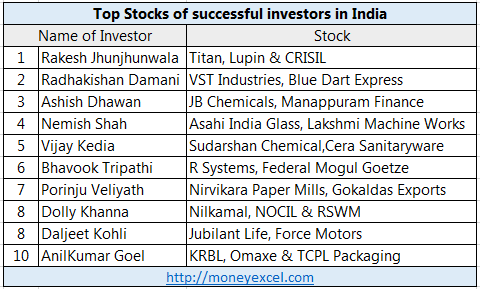 The top stocks holding of successful investors in India is given below. You can defiantly make a money from the stock market because the stock market is the best place to make money. The only thing you require is patience, discipline, and strategy in order to become a successful investor in the stock market. Do you think above-mentioned strategies of successful investor will help you in getting success in the stock market? Do you think top stocks of successful investors is worth for investment?